On behalf of our family and staff, we would like to welcome you to Brown Family Dentistry. Since 1972, we have been serving Neenah, Wisconsin and the greater Fox Valley area. We believe in treating all of our patients like family and in working together as a team while carrying on a tradition of quality, kindness and prevention. Part of our commitment to serving our patients includes providing information that helps them to make more informed decisions about their oral health needs. Throughout our website, you will find an abundance of information about our practice, procedures we provide, and dentistry in general. As you browse through our site, you will see that we offer a variety of services including dental implants, and sedation for procedures such as wisdom tooth extractions. We also specialize in cosmetic dentistry services such as tooth whitening and porcelain veneers. Please explore and learn as much about dentistry and our services as you desire. We believe our patients should have as much information as possible in order to make informed decisions regarding their oral health and treatment options. 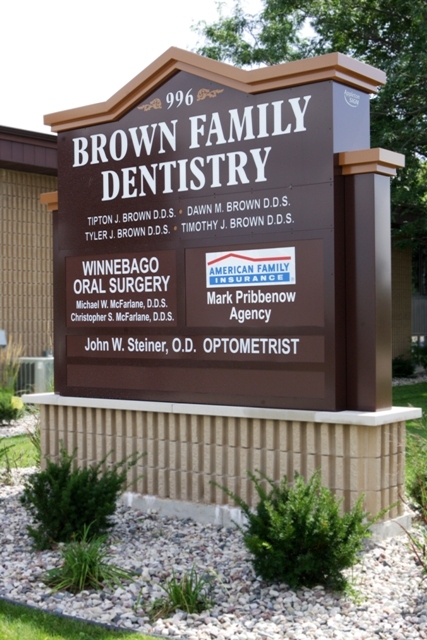 Neenah, Wisconsin Dentists at Brown Family Dentistry is dedicated to family dentistry such as Exams, Teeth Whitening, Veneers and more.